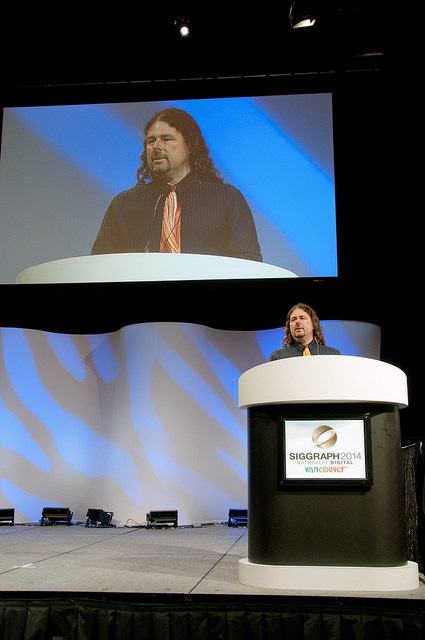 In his opening address Siggraph 2014, Dave Shreiner said “this event is all about technology to enhance peoples lives. But more importantly it’s also about compassion.” Being at conference that was putting people above the technology was a revelation. For the chairman, compassion is the narrative that matters. He introduced everyone to Paulo Henrique Machado from Sao Paulo, Brazil. The computer animator attended Siggraph for the first time despite being confined to a bed and hooked to an artificial respirator 24 hours-a-day. Shreiner’s own iPad adorned Machado’s telepresence robot that allowed him to experience the people, the sights and the sounds in real time. You can learn more about Machado from this BBC feature story. The compassion theme was further amplified in keynote speaker Elliot Kotek. As chief of content and cofounder of Not Impossible Labs he’s a storyteller of the highest order. But he’s also a driving force behind a team whose core belief is that technology has to exist for the sake of humanity. The genesis for Not Impossible Labs was the Eye-Writer project. For Tempt, a world renowned L.A graffiti artist fully paralyzed because of Lou Gehrig’s Disease (ALS), this amazing “hack” now allows him to draw and communicate using only his eyes. 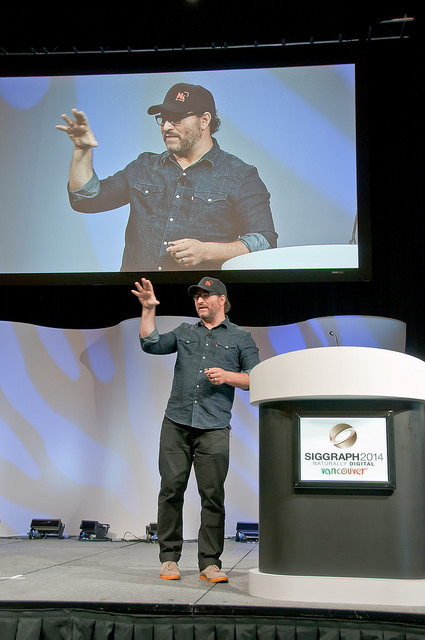 It worth watching Kotek’s partner Mick Ebeling’s TED talk. Time Magazine proclaimed that it’s “hard to imagine any other device here doing more to make the world a better place,” as Kotek’s team leveraged open source CAD files and 3D printing technology to meaningfully transform 14-year-old double-amputee Daniel’s life. Living in war ravaged Sudan, Daniel lost both of his arms during an air raid. Kotek spoke of Daniel despairing about his future and about being a burden to his family and village. By creating a 3D-printed prosthetic arm the impact of seeing Daniel simply feed himself for the first time in two years was massive. Project Daniel was born. Now in Sudan’s Nuba Mountains they have set-up what is likely the world’s first 3D-printing prosthetic lab and training facility. 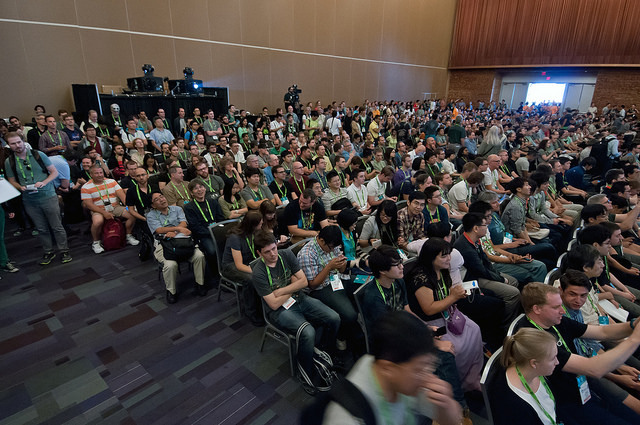 There was no shortage of inspiration at Siggraph 2014. Seeing the very tangible results by fusing compassion with technology will hopefully be a catalyst to transcend inspiration into mobilization.My imagination goes into overdrive thinking about what this collection of exceptionally talented people will do in creating an even richer human experience.